Columbia’s craft beer scene is scheduled to grow to three breweries by this summer. With less-restrictive rules on serving beer in tasting rooms and possible liberalization of the rules for brewpubs, South Carolina’s craft beer industry is starting to produce economic benefits. Joseph Ackerman says that when he first made plans in 2008 to open a craft brewery in Columbia, he was pretty much taking a chance. Joseph Ackerman, owner of Conquest Brewing on South Stadium Road and its brewer, prepares for fermentation of a batch. Ackerman hopes to expand to another S.C. city. “There was a big gap that needed to be filled because Columbia was the only major city in South Carolina without a craft brewery,” he says. Now, not even two years after Ackerman opened Conquest Brewing Co., Columbia’s first production brewery, one more has opened and a third is on the way. With River Rat Brewery’s opening in March and Swamp Cabbage Brewing Co.’s plans to open soon, Columbia’s growing craft beer scene is making a community for itself. “I want other people to be as excited about it as I am,” said former journalist Nick McCormac, author of the beer newsblog “Drink. Blog. Repeat.” The craft beer scene is benefiting at least in part from the growth in people who want to support local businesses and eat and drink local products, he said. In states like Colorado and California, craft beer has become a billion-dollar industry. It added $254 million to South Carolina’s economy in 2012, according to an analysis by the Brewers Association, a national trade group, which defines craft breweries as those producing less than 6 million barrels, or about 186 million gallons, annually. There are also ownership restrictions. Brook Bristow, a lawyer behind the “Beer of SC” blog who helped redraft the recently passed “pint bill,” predicts that growth and market expansion will continue. The taproom at River Rat Brewery functions much like a bar, but as with taprooms at other breweries, is limited in how much it may serve each customer. The “pint bill,” signed into law last year, allows breweries with tasting rooms to serve up to 48 ounces, or 3 pints, per customer each day. The limit had been 16 ounces a day in 4-ounce taster glasses. Selling beer by the pint can be up to five times as profitable as selling by the keg, according to Doug Boyd, co-owner with his brother Ed Boyd of Swamp Cabbage Brewing. Those sales will be monitored for two years, with state regulators reporting back to the Legislature by May 2016 on any violations. Five breweries opened in South Carolina in 2013, bringing the total to 15, and five more hope to begin production in the next few months, according to Bristow’s blog. Brewpubs, which generally are parts of hotels or restaurants and are limited to 2,000 barrels a year for sale on-site. At one of Columbia’s largest beer, wine and liquor stores, Green’s Beverages on Assembly Street, manager Gary Kangas said local beer is starting to sell more, even though until recently sales were limited to half-gallon growlers. Conquest just began bottling a few weeks ago, and River Rat plans to start soon. Passage of the “pint bill” in 2013 allowed breweries with taprooms to sell up to 48 ounces to a customer daily instead of 16 ounces in 4-ounce tasters. 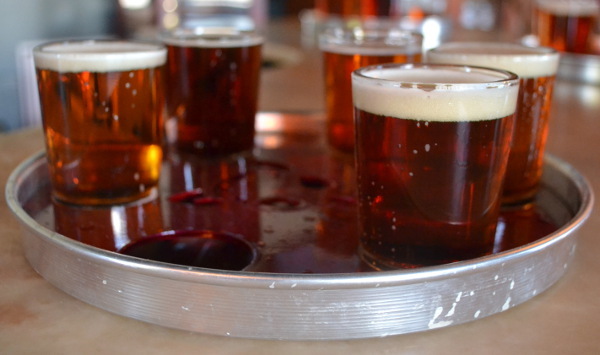 Taster flights remain a staple, though, so that customers can sample several beers at once. At Conquest, Ackerman is trying to balance sales and production with demand, especially since the brewery just began bottling. But he worries less about the city’s awareness of craft beer now. Ackerman said he gets to work with food trucks, chefs and other businesses to be more locally focused. “I get to be involved in a community of artisans in the city,” he said. Bristow predicts 20 operating craft breweries in South Carolina by the end of the year, as well as more development of “session beers” to attract craft beer newcomers. Those are flavorful low-alcohol beers that drinkers can have a few of to fill a “session” without getting intoxicated. As of December, 2,768 of the 2,822 breweries in the U.S. were craft breweries, according to Brewers Association statistics. The number of barrels sold rose to 15.6 million from 13.2 million in 2012. Swamp Cabbage Brewing Co. plans to open this summer on Brookwood Road. The potential for South Carolina’s economy is significant based on industry studies for other states. Research by University of Colorado professors sponsored by the Colorado Brewers Guild estimated the state’s 232 craft breweries produced an $826 million economic benefit in 2013, up from $446 million two years before. The impact in North Carolina was over $791 million, according to Brewers Association estimates. Listen to Nick McCormac talk about his expectations for the craft beer scene in Columbia. Hear McCormac’s take on the craft beer community. Directory of craft breweries and brewpubs in the Carolinas.